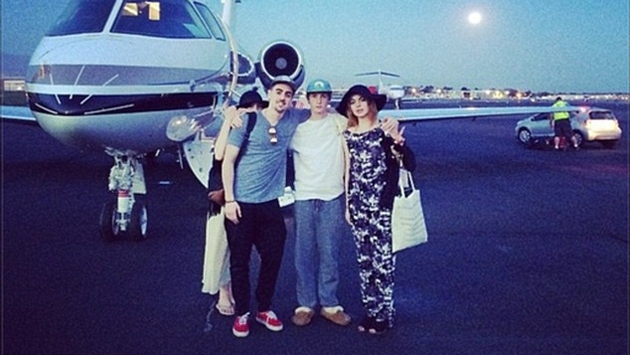 Lindsay Lohan boarded what looked like a private jet, following a fun-filled weekend at Coachella, in the desert of Indio, California with her brothers Michael Jr. and Cody. We assume they were heading home to the East Coast. Lindsay, who is currently trying to have a career comeback, shared an Instagram pic on Monday (April 14), showing her standing on the tarmac arm-in-arm with her siblings in front of the jet. Lindsay's sister Ali also appears to be hiding behind Michael Jr. in the photo. "#jetlife #familyisQuiche #workhardplayhard #secondfemale @mikelohan @codylohan," Lindsay captioned the photo. This new photo comes on the heels of a report claiming Lindsay was spotted drinking at the music festival. An eyewitness told In Touch that Lindsay "looked completely out of it," as she partied with her 20-year-old sister, watching Kid Cudi perform. "She couldn’t stand up straight and she was frantically chain smoking cigarettes. In one of her hands she had a plastic cup with a clear liquid in it," the witness continued. It has been eight months since Lindsay left rehab. Her struggles with staying sober have been documented on the OWN reality show "Lindsay." What do you think of Lindsay throwing down cash to fly home on a private jet?